This book attempts to look at future of technology and need of HR to reorient its philosophy and practices required to build a greater and a better tomorrow, through the views and experiences of a large number of technocrats and leaders, HR practitioners, academicians, business experts, bureaucrats and trade unionists. We have always been overwhelmed by the grandeur of the Sun. The all-powerful, merciful, the creator of our solar system and all lives on our planet. 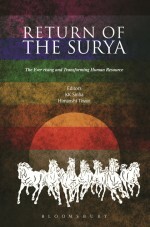 The Surya is the soul of all creations. He is always there with us, around us and is so merciful! We take Him for granted and remain generally unmindful of Him. The world however, has been mostly depending for its increasing needs of energy on fossil fuel, realising now thankfully that this is becoming a major threat to environment and all lives. This realisation has been now driving the globe to be putting greater reliance on renewable sources of energy including the wind, hydro and primarily the Sun. The entire energy value chain is likely to see significant disruption in the coming years and decades. India, which is at an evolving stage in its growth story, promises many opportunities for energy players. The ambitious megaprojects, launched by the Country are likely to drive higher energy consumption. The new thrust on nonconventional and renewable sources of energy has been radically altering the dynamics of the power sector. HR will therefore, have a very important role in understanding energy solutions for the future and it will have to reinvent itself continually to meet the challenges of a technology-driven future, while ensuring not to lose sight of the 'human' aspect of organisation and culture. HR also has to be harnessing its natural capability to be future ready. While technologists and scientists from all over the world are looking for the most green and renewable sources of energy, solar may well emerge as the best substitute for fossil fuels over short time. It could probably allow humans to happily coexist with the flora and fauna, while making the most efficient use of technology. Let us value and celebrate the return of the Surya to make a better world!